The octopus has eight tentacles surrounding its mouth (unlike the squid, which has ten). The common octopus (Octopus vulgaris) is a native of warm waters but can be found in cooler ones, such the English Channel. 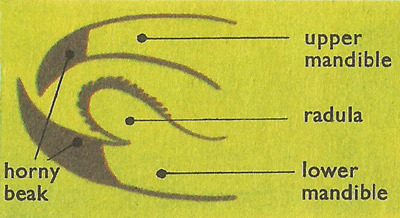 Diagram of the mouth of an octopus; note the ribbon-like radula. Octopuses are diverse, highly intelligent cephalopod molluscs that are found in seas and oceans around the world. Octopuses are eight-limb cephalopods. The largest species is the Giant North Pacific octopus, adults of which typically have a 4.3 meters (14.1 feet) arm span and a weight in the region of 15 kilograms (33 pounds). Octopuses vary in color and have the ability to alter their color to camouflage themselves against their surroundings. To move around octopuses crawl or swim. Normally they crawl, which involves walking on their limbs with their body supported by the water. To move faster they use jet propulsion, taking water into their mantle and expelling it via a muscular siphon. Octopuses are highly intelligent and are considered the most intelligent of the invertebrate. In studies that have involved mazes and other problem-solving, they have exhibited both long and short term memory. They can also be trained to distinguish between different shapes and patterns, and are the only invertebrates known to use tools. Observations have shown them "playing" in their aquariums – for example, repeatedly releasing a toy into a circular current and catching it. Most octopuses have no internal skeleton or outer protective shell; their body is entirely soft, enabling them to squeeze through very small spaces. An exception are octopuses in the suborder Cirrina, which have two fins and an internal shell thus reducing their ability to maneuver in small areas. Octopuses have eight legs that bear suction cups, and a beak similar in shape to that of a parrot. They have three hearts, two that supply the gills and one that pumps copper-rich hemocyanin around the body. Octopuses have a relatively short life expectancy, Some species live for only about six months, whereas others, such as the North Pacific Giant Octopus, can live for up to five years. They die after breeding due to endocrine secretions from two optic glands. Octopuses have an excellent sense of sight (see octopus eye). They can distinguish polarization of light and some species have color vision. They have two special organs called statocysts, which are attached to the brain and enable the octopus to sense the orientation of its body relative to horizontal. The suction cups on an octopus's limbs have chemoreceptors enabling them to taste whatever they touch. The limbs possess tension sensors so the animal knows to what degree its limbs are stretched out. However, octopuses have a very poor proprioceptive sense and can't determine the position of their limbs or body in relation to each other. Octopuses are diverse animals found in just about all of the major marine bodies of water, on the ocean floor, in coastal areas, and around reefs. They have extremely flexible bodies enabling them to squeeze into small holes and crevices in order to escape from predators. They are nest builders and make their homes in rock crevices or areas close to the ocean floor where they may have to dig into the sand to develop a den. Often they will gather rocks and shells to place around the entrance of the den to disguise it. To reproduce, males use a specialized arm called a hectocotylus to insert a spermatophore into the female's mantle cavity. In some species the female can keep the spermatophore for several weeks until her eggs are mature enough to be fertilized. After fertilization the female lays up to 200,000 eggs but this number varies greatly depending on the species. The female attaches the eggs to rocks or hangs them in strings in her lair and then guards them until they are ready to hatch. During this period the female does not feed and gently blows water over the eggs so they get enough oxygen. After 2–10 months, depending on the species, the eggs are ready to hatch and the female leaves. After hatching the young larval octopuses drift in clouds of plankton until they are old enough to descend to the ocean floor where they continue to mature. However, in some deeper dwelling species the youngsters do not go through this period and remain on the sea bed. After breeding both the male and the female die, the male a few months after copulation and the female shortly after she leaves her eggs. Octopuses feed on fish, crabs, and other molluscs. After capturing their prey they quickly kill it by biting it with their hard beak and injecting venom. If an octopus captures a single-shelled mollusc that can't be pulled apart it uses its radula to make a hole in the shell and then injects venom that kills the animal. 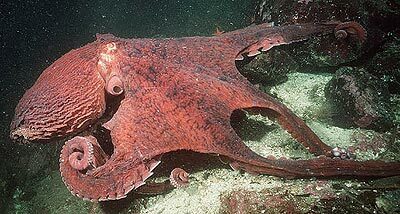 Predators of octopuses include moray and conger eels, sharks, seals, killer whales, dolphins, and large predatory fish. The primary defense of an octopus is to hide and not been seen by a potential predator. If they have been noticed their main secondary defense is to make a rapid escape. Another form of defense is to emit dark colored ink to confuse a predator; this ink is also thought to reduce the efficiency of the predator's olfactory organs. Camouflage is another way octopuses can avoid being caught. They have the ability to change color and blend in with their surroundings, and sometimes they also use the muscles in their skin to change the texture of the mantle to achieve a greater camouflage. Also when they come under attack, some species have the ability to lose one of their limbs in a similar way that a lizard detaches its tail. The detached arm moves around and serves as a distraction to predators while the octopus makes its escape. A few species, such as the mimic octopus, are able to combine the flexibility of their bodies with their color changing ability to accurately mimic other, more dangerous animals such as sea snakes, eels, and lionfish. Octopuses belong to the order Octopoda within the class Cephalopoda. There are two suborders, Cirrina and Incirrina, which together comprise about 300 species. • Octopus is common in the cuisines of many different countries including Japan, Hawaii, Spain, Italy, and Portugal. • Due to their intelligence and problem solving skills, captive octopuses often escape from supposedly secure tanks. 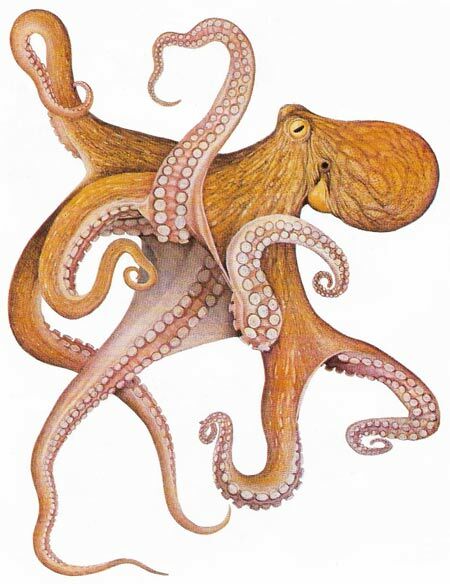 • The word octopus comes from the Greek for "eight-footed." The most commonly used plural is octopuses, but octopodes and octopi can also be used. • All octopuses are venomous but only the blue-ringed octopuses are deadly to humans.